This gorgeous ring is decorated by long arcs of tiny raindrops, scrollwork and starred buttons above and below the stone. 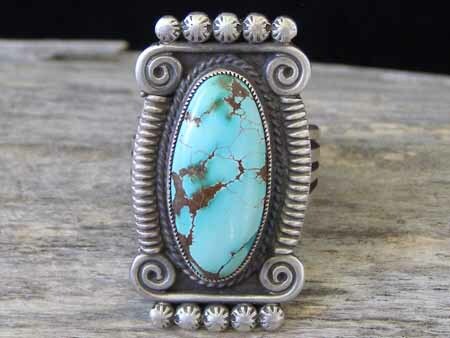 Calvin set an exquisite oval of natural, untreated Royston turquoise in this ring. This split-shank ring separates into four narrower bands in front which attach to the ring back. Hallmarked "C.MTZ" inside an arrowhead and stamped "Navajo" and "Sterling". Ring face: 1 5/16" x 3/4"